I've always had a thing for Kate Spade's designs in handbags, shoes and colorful cardigans. Those trademark circles and stripes make me positively weak in the knees. As if we couldn't love Kate enough as it is, the dream team at Casa de Spade have created an entirely new line, just for we brides-to-be! I give you, Wedding Belles by Kate Spade. The first items to catch my eye were the swoon-worthy shoes...oh my, my, my ya'll...be still my heart. I also immediately fell in love with the plethora of accessories, including the presh I Married Adventure clutch...adorable, right? The bridesmaid dresses, perfect for a color-loving wedding party, are so figure flattering and femme. I especially love the blue Ikat patterned dress (right) as an untraditional bridesmaid dress. Finally, Kate Spade even covered gifts for your wedding party. If you're in search of the perfect thank-you present to your maids, look no further. A couple of the standouts below. Never has there been a better time to be a Belle, ladies! 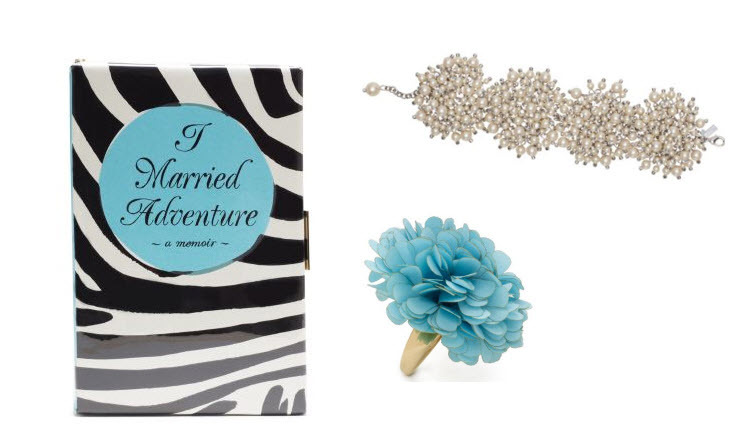 Bookmark these pages and start planning the attire for your Big Day, Spade-style! LOVE the bright colors and that yellow dress is such a WIN! I love those blue shoes. Even though I got married a few years ago I am loving that you are sharing your wedding fun on here- I love all things wedding :)! Have fun! Kate Spade can do no wrong. The Wedding Belles collection is fabulous! I'm planning on ordering that gold necklace that says Mrs. I am also interested in some of the shoes for the wedding. Kate Spade is always a mood lifter! I love that round barrette! So pretty! Fantastic post, thank you! I adore that yellow dress as well it is so chic! the heels with the glitter are perfection. how fun! I enjoyed my visit to your blog. Hugs! oh so much fun stuff! i adore that yellow bridesmaid dress, it is just so cute!! and the sparkly heels? adore! Oh my gosh! I am in love with those blue shoes! You must get them! These blue shoes are to die for! So cute! That yellow dress is great.